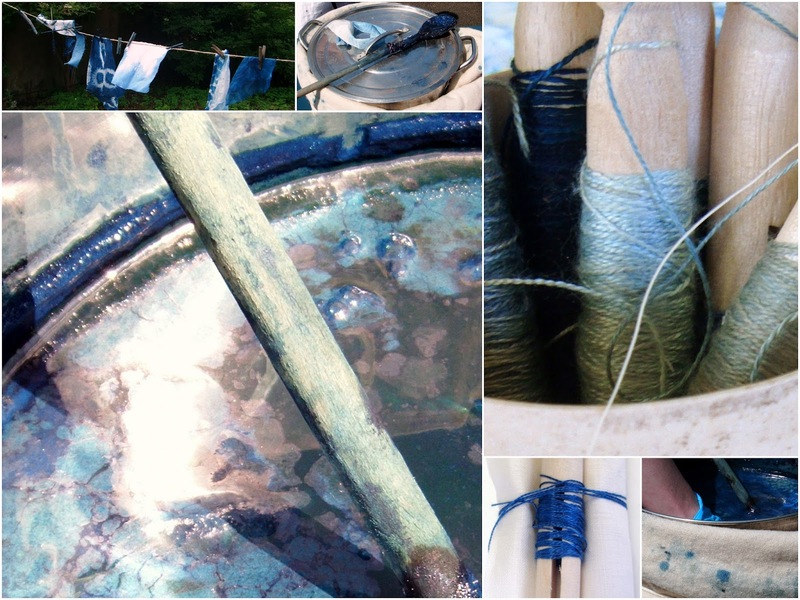 Sometimes advance planning pays off: yesterday, although I thought I was way, way too busy to take time out, I spent the day indigo dyeing. I had booked, I had paid my deposit, so I went. This was a new departure for me: both the dyeing and, as it happens, taking any sort of course. I hadn't been able to find anything I fancied that was within sensible striking distance, but have now discovered the lovely Hope and Elvis only a 40 minute drive away. The day was led by Claire Wellesley Smith who not only works with natural dyes but is big on slow stitching (hooray) and whose own work is well worth checking out. For me this was a great way to kill several birds with one stone. Firstly, though I love the idea of hand-dyed fabric, I am coming to accept that there isn't enough time in this life to master everything and this allowed me to dip my toe in without a) acquiring a load more stuff I would have to store somewhere and b) making a most almighty mess at home. The second benefit is that I have lovely new bits to add to my stash and the third is that I had a lot of fun stitching before my bits were dyed (as you can see from the pieces below. In fact I think that if I were going to get hooked enough to acquire aforementioned stuff and make the mess, it would be this combination of stitch and colour that would get me hooked. But for now, I have enough going on, so am just thankful for a day of fun. Looks like you had fun and what an intersting results! It is time I dyed some more fabric for backgrounds to embroidery. Come and join me. I'll clear up the mess! Does that mean we are neighbours? I also live near Welbeck - I'm in Nottingham. It looks like you had a fun day, some interesting effects. I'm off to check out their workshops! Beautiful Kaja! And it sure does seem like the perfect way to dip your toes in the dye vats. Beautiful colours, Kaja!! I think you found the perfect solution. I love the photos you took.